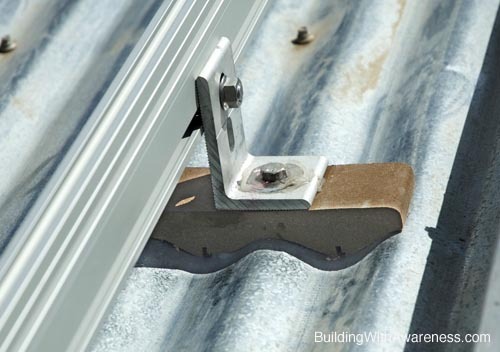 This article will show how to attach commercially available solar panel mounting brackets to a corrugated metal roof that lacked flat surfaces. 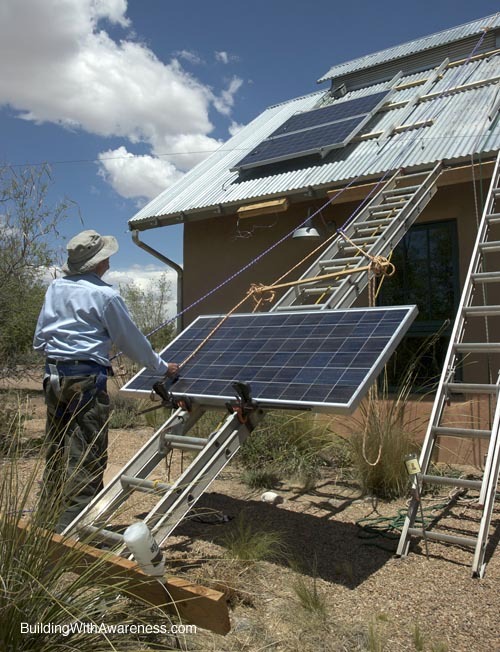 In the photo above, a ladder was used to slide the PV panels to the roof. Photovoltaic (PV) panels produce all of the electricity for this straw bale hybrid home from sunlight. All of the PV panels are permanently attached to the south facing pitched roof. Standing-seam metal roofs are partially flat, so mounting a rack is not a problem. The roof on my house is corrugated metal and therefore has no flat surfaces for the aluminum mounting brackets to seat. 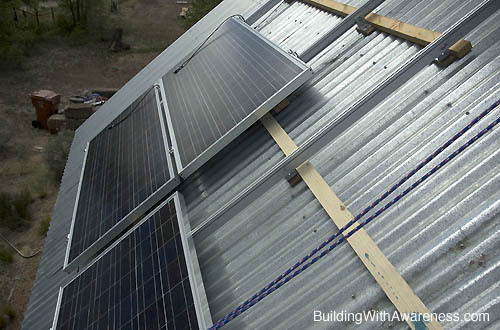 A stout connection is essential for the photovoltaic panels to survive high wind loads and to create a waterproof seal where the bolts penetrate the roof surface. What we needed was a mounting platform that both comformed to the convolutions of the metal roof and also had a flat surface for the foot bracket to contact. Plastic wood (such as Trex® that is sold for outdoor decking) was cut on a bandsaw to match the profile of the metal roof sheeting. The material was chosen for its proven durability and long life in outdoor use. This spacer made for a flat surface for the foot of the aluminum mounting bracket. As the bolts are tightened, the contoured custom spacer applies even pressure to the corrugated sheeting, so there is no denting or distortion. Due to the four-inch width of the new mounting platform (it was cut from a 2×4″ piece of artificial wood), there was now room to move the bolt location left or right in order to center it directly over the roof truss below the sheeting. Note that a groove was cut into the base of the contoured mounting spacer. This prevents water from pooling on the uphill side. Ample amounts of silicone caulk were used on the bolt itself and around the bolt to ensure that water would not leak through the roof. In this wide view, the vertical rails of the UniRack SolarMount® system can be seen resting on the custom plastic-wood mounts. The photovoltaic panels are then attached to the rails. The long 2×3″ strips of wood are used as a temporary foot rest so that one does not slide down the slick surface. They are slid out once the PV panels are in place and wired. For safety, it is essential to wear a rock climber’s safety harness while working on a steep roof such as this. 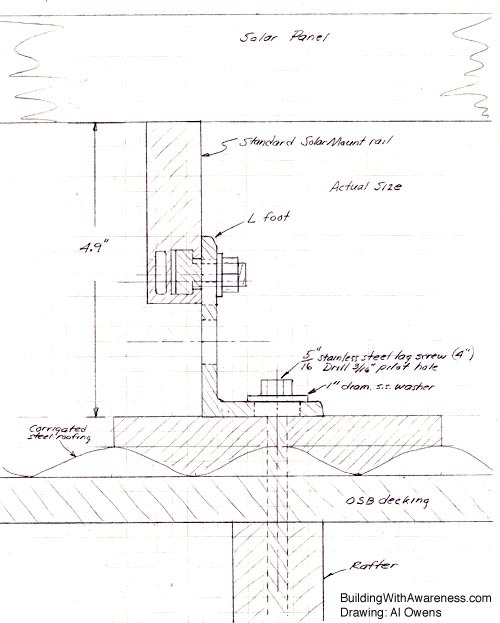 Below is a drawing of a cross-section view of the mounting system. With the panels in place, this house will have all of its electrical needs generated by sunlight alone. Between the photovoltaic electrical system, the insulated straw bale walls, and the rainwater collected from the roof, this is a very green hybrid home. Ted, I like your idea of using artificial decking material. I have the same type of roof and I want to mount a solar hot water system. I was thinking, before I read your article, of attaching pressure treated wood to the corrugated roof and then attaching the solar brackets to that, but pressure treated wood can leach chemicals onto the metal roof and that can cause corrosion over time so I like your idea a lot more. Thanks for posting it. 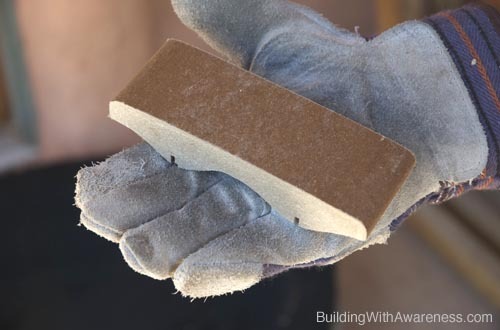 The water flow will be blocked by this technique, may cause build up and roof leaks depending how close to roofing joint the mount is placed. Nice solution. If you have access to the inner surface of the roof or attic, there’s no need to lag into the rafters, which may not be conveniently placed for the best arrangement of “L” feet. 2 x 6 Blocks can be cut to fill the spaces between the rafters or trusses from below, and nailed to the rafters. You can then lag screw into these “backer boards”, which can pull the entire roof assembly tightly together. I’ve used this method for mounting PV as well as solar hot water arrays, and it can save a lot of time and careful lag screw placement. Hi Ted, I’m doing a similar install. Can you shed some light on the following please ? 1. With vertical mounted rails on a significantly pitched roof, did you have any concerns that the mid and end clips would not hold under load (snow load is an issue here) ? I was thinking of drilling through the rail and attaching the bottom end clip with a long bolt. 2. The instruction manual says to start from the top and work your way down, row by row. Once everything is installed then trim the excess rail from the bottoms. This is impossible to do with vertically mounted rails as the rail has to be the right length to get the bottom end clip in place. How did you solve this ? Did you go column by column, from bottom to top ? While that is a good idea, there is a better, faster way. Unirac has a hanger bolt designed for just this application. it provides a much cleaner looking finish. I have used these a number of times with very nice and clean results, it also allows for some vertical adjustment, allowing you to keep your rails very close to your roofing material and also adjust for uneven roofs. This has not been the case—although every installation should be evaluated for it’s specific requirements. Drainage slots have been cut into the supports where they contact the roof. In addition, even if water did build up, with a roof of this slope, it would be a non-issue as the water could not back up more than an inch. Even in downpours, the water quickly drains away. 2. Due to the steep slope of the roof, and having only a two-person crew for the installation, we started from the bottom and worked up. This allowed us to align the lower rails (we pre-cut them to length) for aesthetic reasons. If the upper rails were a bit off, they would never show. Starting from the bottom was also done for safety reasons. If a panel, or person, started to slide down the roof, there would be something to stop it. When working from the top down, you must have a method to prevent the lower panel from sliding off. It just seemed easier to install it this way. Thank you for posting the info regarding the Unirac hanger bolt. The only note I will add is to always insure that you have at least 5″ of clearance between the panels and the top surface of the roof (always refer to the PV-manufacturers instructions). The panels will stay cooler and run more efficiently with proper ventilation. I have seen problems with PV panels becoming damaged due to overheating in the hot desert sun when there has not been sufficient airflow under the panel. need some details for pv mounts for various metal roof commercial and residential installations. When the house was constructed, we ran metal conduit up to the ridge vent on the roof. When it came time to install the panels, we just fed the electrical wires into the conduit and down to the inverter inside the home. Hi, Thanks for your wonderful soultion, Could you please illustate further how the wooden sapcer is being connected with existing rafter/purlin.